101 outpatients suffering from anxiety of non-psychotic origin (DSM-III-R criteria: agoraphobia, specific phobia, generalized anxiety disorder, and adjustment disorder with anxiety) were included in a 25-week multicenter randomized placebo-controlled double-blind trial with WS 1490, a special extract of kava-kava. In the main outcome criterion, the Hamilton Anxiety Scale (HAMA), there was a significant superiority of the test drug starting from week 8 on. WS 1490 was also found to be superior with respect to the secondary outcome variables. HAMA subscores somatic and psychic anxiety, Clinical Global Impression, Self-Report Symptom Inventory - 90 Items revised, and Adjective Mood Scale. Adverse events were rare and distributed evenly in both groups. 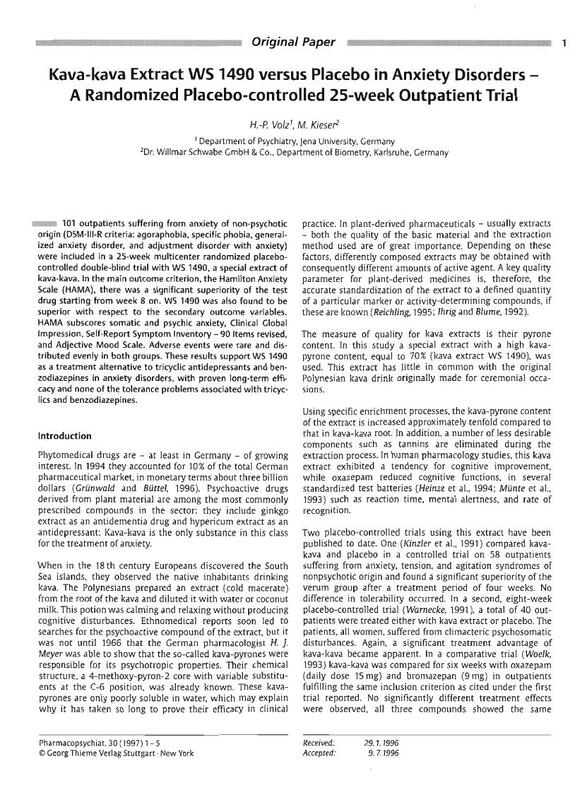 These results support WS 1490 as a treatment alternative to tricyclic antidepressants and benzodiazepines in anxiety disorders, with proven long-term efficacy and none of the tolerance problems associated with tricyclics and benzodiazepines.